The Xterra Fitness FS1.5 comes packed with features and a compact design at an affordable price of under $300. Decent features and components for a very affordable price. Smooth stride motion that is also silent due to magnetic resistance. Compact design that is easy to move around and good for small homes. 24 levels of magnetic resistance allow for challenging workouts. Comes with 22 built-in workouts, with 12 presets and four users profiles. A small 14″ stride area makes it difficult for tall users. Only 1-year warranty frame and parts. The Xterra FS 1.5 comes packed with features and a compact design at an affordable price of under $300. With its rear-drive system and magnetic resistance on the stride, this unit can allow users to have a smooth and enjoyable ride while keeping silent throughout operations. The multiple pre-installed workout programs combined with the different levels of adjustable resistance allows you to customize your experience for optimum calorie burn. One thing to note is that there are no incline options with this model – something that is common among budget machines. Large foot pedals with a non slippery surface. Movable handlebars and pulse sensors on stationary handlebars. Dimensions: 50”L x 23”W x 64.2”H. Water bottle holder and reading rack. For an entry level machine, the FS1.5 performs according to its price. It is not too noisy under operation, the magnetic resistance delivers smooth motion, and the pre-installed workouts are decent for a good cardio workout. There are some complaints of the machine being too light and that it needs to be anchored down to make it less wobbly. The stride length might not be too comfortable for taller people (which is evident), and the speakers are not too great. Overall, it is a reliable machine without the “premium” feel to it. When it comes to durability and sturdiness, we can say that the FS1.5 was mainly targeted at casual fitness enthusiasts. Shorter and lighter users face little or no problems with the machine, but it starts to be difficult otherwise. In most case, it should be good enough to last over a year with regular use before any major issues arise. The assembly of this machine is quite simple, and most of the complex components come assembled. The instruction manual should be able to guide even the newest of users to set it up for use within an hour. It also comes with a hardware bag that contains all of the tools required for the entire assembly process. There are lots of other machines around the $300 mark from Sunny Health, Stamina and Exerpeutic that you can compare this to. 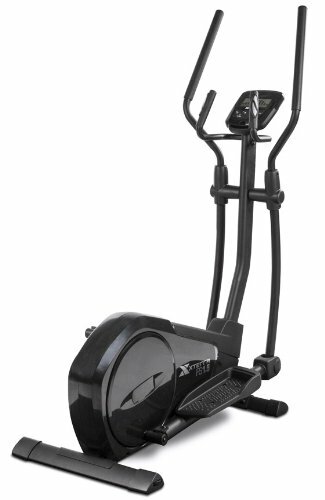 However, if you are simply looking for a standard elliptical machine for casual workouts at the comfort of your home, it is a safe option. The features are decent, and it does not lack anything notable that other brands offer within this price range. One thing to remember is that it is not built for large or heavyweight people. For casual trainers, the Xterra FS 1.5 is overall good value for money and should not disappoint.